I first came across this call-and-response song when I was doing the Trinity College/Open University course for Wider Opportunities and Primary Music “Practioners” (how I HATE that word!). The course was a mixture of on-line units and taught sessions, and this is a song from one of these sessions. I asked a teacher from Ghana what the words meant. He was a little dismissive; perhaps it is a bit irritating to have snitches and snatches of songs from your country and culture being hi-jacked and taught at random without any real reference to their origins. 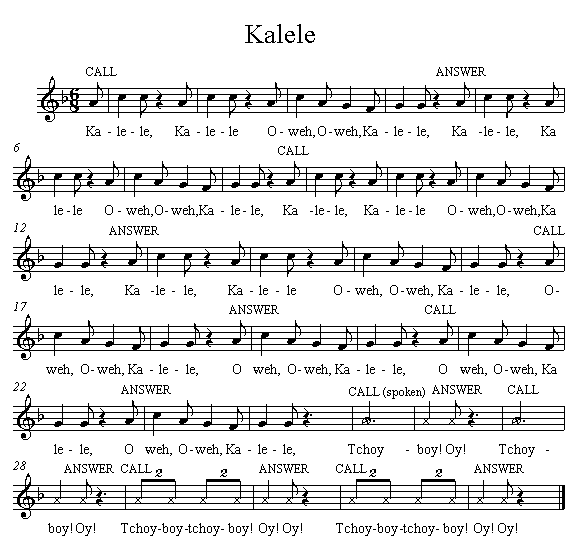 Anyway, this song seems to be a bit of a mash-up of several bits and pieces; someone telling someone that they will be late if they don’t get a move on (the “kalele” bit), and then the equivalent of the sort of thing you say when you are all going to lift something heavy together (“Tchoy-boy! Oy!”). Whatever the song is, or isn’t, it is a jolly good sing. Teach it by rote, and take it at a lively, relaxed pace. The “Tchoy-boy” bit is said, in a sort of rising, anticipatory way. “Oy” is a bit of a shout. Once we know it, I do it three times; once at a normal level, once very, very quietly, including whispered “tchoy-boy” and “oy”, and finally, as loud as can be SUNG without it becoming an unpleasant shouty noise. If you get this right, the children are usually stunned by the sudden silence at the end. Then try it on instruments as call and response, but without singing.